Usman Garuba is a physical phenom since he was a kid, being very advanced comparing with players of his age. His strength, power and athleticism had no comparison when he was U12 player and still is a top athlete in those aspects. Garuba uses his body great to create advantage but his room to improve is not big due his advanced development. His quickness and coordination are also remarkable. The evolution of Garuba shooting tools is in the right way, he is able to hit shots from the top of the key and his free throw percentage experimented an increase during last season. His touch is average in the paint but he could become a solid spot up shooter from mid-range and occasional 3-point shooter off the catch. Garuba is an inside player that dominates in the paint due his great combination of strength and speed. He moves well off the ball and he understand the spacing game. Garuba loves to push the ball in transition when he grabs a rebound and he is able to finish or dish the ball. Also he is a great passer from the top of the key. He barely tries to beat his defender from perimeter off the dribble and his ball-handling is just average with a few use of his weak hand. Defensively Garuba is really hard to beat at low post and has good timing to help from helpside. His lateral quickness is just average and he struggles a bit guarding perimeter players. In rebounding terms he shows hungry to grab all the rebounds but not always has the previous work of box out his opponent. At this level Garuba is a great rim protector. 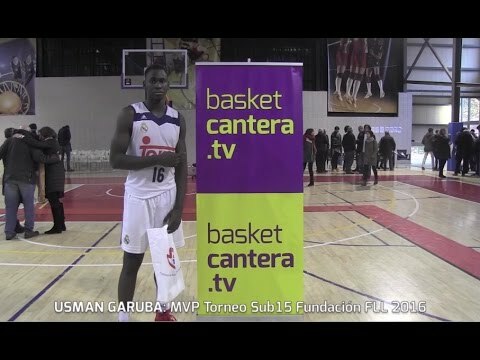 Garuba was selected MVP of FIBA U16 European Championship being two years younger than the competition. His impact in the game is very high and is hard to find a game that he loses. Born in Madrid and raised in Azuqueca de Henares (around Madrid) he has a little brother Ab Sediq Garuba (’04) that also plays in Real Madrid. Usman Garuba is the most dominating U14-U16 player ever due his great combination of strength, athleticism, speed, skills and basketball IQ. His upside is limited as an inside player and he should move to a small forward position to try to be as successful at the pro level as he is now in youth teams.